This is one of the simplest little tunes I’ve ever posted. But I’ve enjoyed playing this seemingly all out-of-proportion to its simplicity. To my ears the simple tune takes on different characters just by making slight changes to the steady rhythm, or the phrase that rises from C to A. And it is easy to add harmony using chords with the melody notes in the treble or just using a straight progression starting or ending on a melody note. And it’s easy, too, on keyboard to create a split and alternate the simple melody between two voices. I enjoyed most, I think, using a very synth sounding voice to start each little phrase and a flute to finish off the phrase. I made up this little melody on guitar, then moved to keyboard. I noticed then when I went back to guitar it was even more fun, maybe because I was more familiar with the intervals and I can play so much more freely on guitar. I’m a fan of arranger keyboards, as compared to synthesizers that are more focused on crafting particular sounds. It has always seemed to me—and it continues to seem to me—that what a musician does with sounds is much more important than the particular sounds themselves. I wonder if a particular melody might be like what a painter calls a “motif,” and although a painter may paint a particular motif in many different ways depending on, say, the light at a particular time of day or the painter’s mood, if the painter is at all realistic there always will be some discernible underlying similarity visible from variation to variation of the images of the same motif. It’s remarkable, for instance, comparing Cézanne’s paintings to photographs of his motifs—it’s almost always reasonably easy to see what Cézanne started from. So I wonder if any given melody might have some particular sound or sounds which bring out and emphasize the very basic nature of the melody itself. —when I see images like this I get to thinking that a sound-oriented synthesizer might be a great deal of fun for exploring that question: Does a melody have a particular defining nature that is separate from the mood or intention of the musician playing the melody? And, if so, it would be fun exploring the process of discovering the sounds that seem to “work best” for a given melody, the sounds which seem to emphasize the underlying nature of the melody, if a melody has such a thing as its own underlying nature separate from the musician arranging and playing it. I like that particular image because there’s a guitar in the background and a computer on the desk, and there’s the synthesizer workstation as a tool that works well with those other tools. It’s like a mad scientist’s laboratory and it only takes up one corner of a room. I’ve always been uncomfortable with distance as a literal thing. I like staying in Chicago. I love Lake Michigan. But I’ve always been interested in distance as a figurative thing. Traveling to the stars with binoculars or telescopes. Traveling into music with capable instruments and tools. Traveling into hearts and minds with reading and writing. I strongly suspect that just as these “figurative” distances have a metaphoric relationship (or a metonymy relationship) to real distance, in a somehow comparable way there is a third reality that has a corresponding relationship to the figurative. I strongly suspect there is something that is abstracted away from figurative distance in a similar way that figurative distance is abstracted away from real physical distance. Mad scientist stuff. But for real. And something like the opposite of making monsters. Rather it’s something like discovering what human is. Seems to me it’s stuff worth doing. she’s wearing her guitar like a backpack. Keith Richards or Jeff Beck wear their guitar. protected guitars more than soft cases. because they didn’t get money from gigs. at the pointy-end of the guitar’s neck. from the player to protect their tuners. for years. That photograph is five years old. even if there’s not a guitar in it. have one answer. And it’s a good one too. when it first made the media rounds. for something like five years. Today’s post is a kind of afterword to two posts from last week. That book has become more interesting to me after I read it than it was while I was reading it. While I was reading it I was mostly thinking that she wasn’t really sharing any new stories. And that’s true. There wasn’t much new in there that Beatles fans didn’t have access to in other books. But after I read Cynthia Lennon’s account—and if we can believe the front-matter she wrote the book herself, without a co-writer—I was really touched by many of the things she did say, and I became more and more interested thinking about how she said things and why she picked certain things to say. And her final words are interesting to me, too. "But the truth is that if I'd known as a teenager what falling for John would lead to, I would have turned round right then and walked away." I’m a talkative person. In my life I’ve talked to a lot of different types of people—I mean things like education backgrounds, economic backgrounds, social backgrounds. I have heard sentiments like this far more often than I’d ever have expected and from every “type” of person imaginable. Some aspects of life are so difficult to understand, almost inconceivable, that even if you try, struggle, with all your heart and all your soul and all your strength and all your mind to understand what is happening to you and around you, by the time you figure it out, if you figure it out at all, it can be too late to even hope for a second chance. Because your whole life will be behind you. And you will have been completely shaped by the life you lived. For as long as I can remember, I’ve been the kind of person who, if given a second chance, almost always just makes the same mistakes all over again. Or some variation of the same mistakes. So I admire people who can learn quickly from their errors and make significant corrections and seriously improve. Because I usually can’t. That being said, at the same time I admire people, too, who work out a course of action in the abstract, and then set out to make their vision real. And keep trying and keep trying and keep trying. The issue, I think, is that it’s good to be tenacious but it’s bad to be stubborn, and it’s not always clear where to draw the line. The time I spent thinking about that is time I’ll never get back. I’ll never get a second chance to use that time more constructively. And even if I did, I know I wouldn’t. If I can trust my memory and the Blogger search utility—and, really, I don’t much trust either one but the combination is the best I have right now—I have quoted that old TV show twice here at the blog. 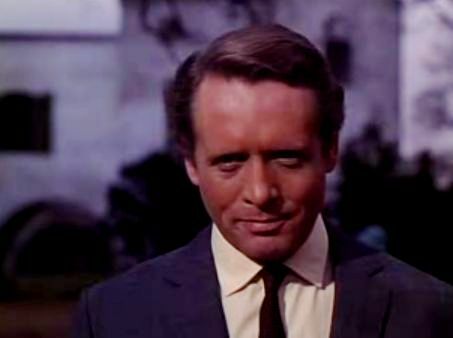 I’m going to stop quoting old TV shows (and, in fact, TV shows entirely) but I want to do this one last quote because it will wrap up my interest in “The Prisoner,” and because I’ve wanted to do this particular quote for a long time and now I finally have a post talking about second chances. The story—in very quick overview—is about Number 2 trying to drive Number 6 insane by first subjecting him to behavior modification and drugs which change some of his habits and then bringing in an agent, “Curtis,” who is an exact physical double for Number 6 and who has practiced mimicking Number 6’s personality, and his mental skills and physical skills in every way. Also there is a woman from the Village, Number 24, who has become friends with Number 6 because she and Number 6 realized they have a mild kind of low-level telepathic bond. They can’t read each other’s mind, but they can, often and inexplicably, make the same guess or make the same choice or just randomly work in unison without explicitly coordinating their actions. And, more simply, they can just “feel” each other’s presence. Number 2 confronts Number 6 with “Curtis” and accuses Number 6 of being an imposter. As Number 2 “proves” to Number 6 he isn’t who he thinks he is, Number 2 documents Number 6’s old habits which are now changed (Number 6 has no memory of the behavior mod program that changed his habits) and “Curtis” is able to best Number 6 at all of Number 6’s mental and physical challenges (Number 6 is weakened from the drug treatments) and, finally, Number 2 brings in the telepathic woman. 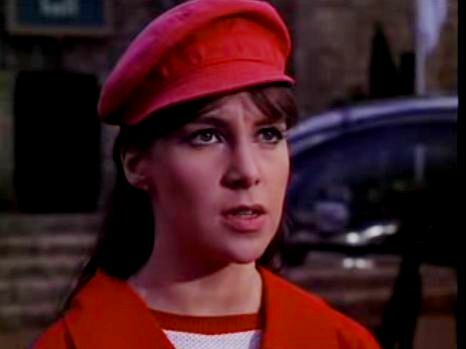 She is able to perform her telepathic link with “Curtis” but not with Number 6 (viewers then realize that the telepathic woman, Number 24, really is an agent working with Number 2). As the plot unfolds, through complications and his skills, Number 6 is able to recover his memory, defeat “Curtis” and manipulate Village security into killing “Curtis” thinking he was really Number 6. So, getting to the end, Number 6 has assumed the identity of the agent who had been brought in to assume his identity. As Number 6 impersonates “Curtis” he is driven by Number 2 to the airfield where he will be allowed to fly away in a helicopter. Number 2 goes off for a moment to talk to someone. Number 6 discovers that the telepathic woman, Number 24, is waiting for him there at the airport. She confronts him, alone. Because of their telepathic bond, she realizes, of course, that he isn’t “Curtis,” and Number 6 knows, too, that she sees through him. Will she turn him in? And as Number 2 returns, Number 24 simply turns and walks away. She’s true to her word, and having been given a second chance, she doesn’t betray Number 6 again. Strangely, the Sergeant Pepper album originated with a song which was never on it, “Strawberry Fields.” That November John came into the studio, and we went into our regular routine. I sat on my high stool with Paul standing beside me, and John stood in front of us with his acoustic guitar and sang the song. It was absolutely lovely. Then we tried with Ringo on drums, and Paul and George on their bass and electric guitars. It started to get heavy—it wasn’t the gentle song that I had first heard. in anything I was talking about. “Their music shaped generations,” I said. She laughed. At least she was interested. I told her I thought I’d read that somewhere. singing solo to acoustic guitar. I thought, they liked doing something different. And I thought, they liked experimenting. instead of making it about machines? She laughed and interrupted my thinking. “I can play you like a guitar,” she said. onto your face something like inside-out. I said, “You should be grateful to the boys. even one single thought she was thinking. people would know witches were being killed. Do you believe witches now don’t get killed? “So what?” she asked. And she smiled, shrugged and laughed. I don’t have much today, but I have a little thing that has been causing me a lot of thought. When something happens unexpectedly and some little, seemingly trivial, piece of information makes itself known all by itself, by accident even, that often gets me thinking more than if I had researched something carefully on my own initiative. I know random stuff happens and it’s just random. I am not someone who dis-believes in coincidence or chance. But at the same time I am one of those people who often wonder if there might be much more to some coincidences and random chance events than most of us traditionally allow. I don’t know. But one of these little kind of random things has popped up and it’s causing me a lot of thought so I’m going to do a post about it. In fact, this may end up using two posts, today and tomorrow. I don’t know. This goes back to a couple of days ago when I visited the Chicago library and wrote about my visit in my Tuesday post The Song And Sight Exactly. 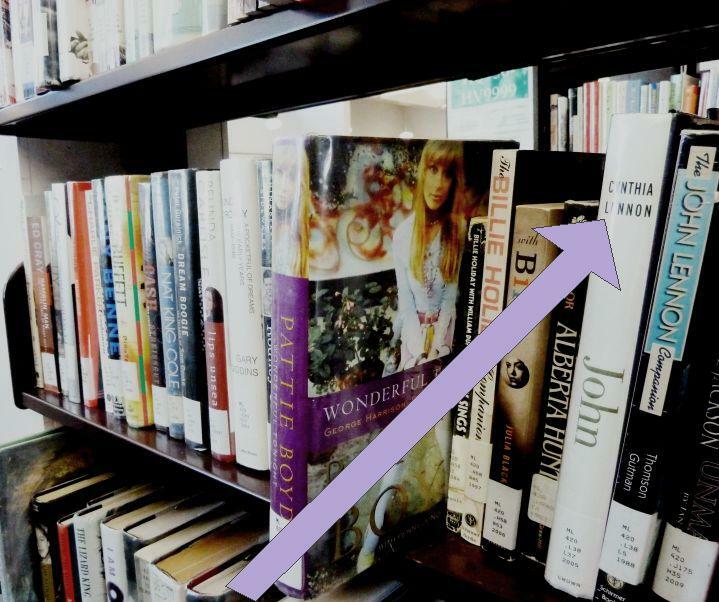 When I was in the Chicago library I accidently stumbled on Pattie Boyd’s autobiography. The cover art and the sad story of that book have stayed with me for many years. 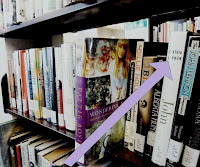 So I made a little moment of the scene by photographing the Pattie Boyd book on the shelf in the library. I let that composition stay with the picture just because it seemed like a good sideways kind of reference—I was taking a picture of a book by George’s wife and there at the side of the image was a book by John’s wife. But then I found myself thinking more about that book, Cynthia Lennon’s book. For reasons I’ll talk about below, I had never read Cynthia Lennon’s autobiography. But after I took that photograph of Pattie Boyd’s autobiography, and then found myself continuing to think about the Cynthia Lennon book, I visited a library near here and took out a copy. I read the book yesterday. I’m going to post today about Cynthia Lennon’s book, but before I talk about her book I want to say something about this topic, the Beatles. By 2005 when Cynthia Lennon wrote her autobiography I had already stopped reading about the Beatles. I have already mentioned in an old post that I find it very frustrating reading about the Beatles because almost every new book contains a slightly different narrative and it is impossible to sort out what should be believed, what should be dismissed, and what should be “interpreted” to get at something like a real truth. Having written so many posts about the Beatles (and I’ve written one or two others that mention the Beatles just in passing), it might sound bizarre for me to say this, but: I don’t like writing about the Beatles. It’s something like “Star Wars.” It’s a topic I know, I guess, a lot about, but it’s a part of reality that has gone from being fun and exciting to being simply tragic and endlessly sad. I try to avoid such things. But sometimes I make an exception. For the Beatles, I thought I had said everything I’d ever want to say in “Buying The Beatles Forever.” But this one last thing has sort of pushed itself into my awareness and I’m going to write about it today just for the sake of completeness or just for the sake of being responsive to the strange accidental nature of this little bit of awareness. I don’t know. But I am going to make a conscious effort for today, and possibly tomorrow, to be the last things I write about the Beatles. Cynthia Lennon does something very strange at the very start of her book. Something very strange and—I’m guessing—something that to many long-time Beatles fans and followers is wildly odd and unexpected. She begins her book with normal front-matter: There’s an “acknowledgements” page. Then a “forward” by Julian Lennon. Then an “introduction” by Cynthia herself. Then when the actual book itself starts, the first anecdote stretching over pages 1-3 is about the death of Mal Evans. This book by Cynthia Lennon will contain nothing new. It will be just a review of the standard Beatles narrative from Cynthia Lennon’s very limited perspective. But she begins the book with an extended anecdote about what is certainly one of the most mysterious and most perplexing deaths of the various deaths associated with the standard Beatles narrative, the almost nonsensical death of the long-time roadie/friend/producer/musician[?]/writer[? ]/confidant of all four of the Beatles, Mal Evans. I mean: Cynthia Lennon discusses the death of Mal Evans before she gets around to talking about John at all [!] and then she transitions directly from the death of Mal Evans in 1976 to the murder of John Lennon in 1980. I don't know what that’s about. Malcolm Frederick "Mal" Evans (27 May 1935 – 5 January 1976) was best known as the road manager, assistant, and a friend of The Beatles. In the early 1960s, Evans was employed as a telephone engineer, and also worked part-time as a bouncer at the Cavern Club. The Beatles' manager, Brian Epstein, later hired Evans as the group's assistant road manager, in tandem with Neil Aspinall. Peter Brown (one of Epstein's staff) later wrote that Evans was "a kindly, but menacing-looking young man". Evans contributed to recordings, and appeared in some of the films the group made. After The Beatles stopped touring in 1966, Evans carried on assisting them until their break-up in 1970. From 1969, Evans also found work as a record producer (most notably with Badfinger's top 10 hit "No Matter What"). Evans was killed by police on 5 January 1976, at his home in Los Angeles. Officers were called when his girlfriend phoned the police and told them that Evans was confused and had a gun. The police believed that the air rifle Evans was holding was a rifle and shot him dead. When Mal Evans was killed in Los Angeles, he had been working on his autobiography, to be called, “Living the Beatles’ Legend.” His co-writer was there, as was a young woman, the night he was shot. The book was wildly anticipated by fans of the Beatles because Mal Evans was such an insider, someone who had been there from almost the very beginning. And the rumors were that he was going to be the first insider to write a tell-all book that actually told-all. Something like ten years later material that was supposedly background notes for the book surfaced at a New York publisher. At that point—a decade after his death—who knows how complete the material was or, really, its provenance? So Cynthia Lennon decided to start her autobiography with a story about Mal Evans being killed. Mal had been a faithful friend to the boys and was especially close to John: they got on incredibly well and, with the Beatles’ other loyal roadie, Neil Aspinall, he had been on every tour, organizing, trouble-shooting, protecting and looking after them. When the Beatles broke up Mal had been lost. He’d gone to live in Los Angeles where he began drinking and taking drugs. It was there, on January 4, 1976, that the police had been called by his girlfriend during a row. She claimed that Mal had pulled a gun on her, and when they burst into the apartment the officers found Mal holding a gun. Apparently he pointed it at them before they shot him. It was only after he died that they found the gun wasn’t loaded. It was a tragic story, and we could only imagine that Mal had been under the influence of drugs. The Mal we knew could no more have shot someone than flown to the moon. Whatever the true story, his death had shocked us all and that night, our talk around Mo’s fireplace was of what a good man he had been and how awful his premature death was. To us, the idea of being shot was almost unimaginable—how could it have happened to such a good friend? Cynthia Lennon doesn’t add much to the standard Beatles narrative in this book. But she does tell one more story, very briefly and very late in the book, that is interesting as a kind of companion piece to the story she started her book with. Shortly after John Lennon’s murder, a man who was a friend of both John and Cynthia confided to Cynthia that John had been keeping detailed diaries for many years. The man told Cynthia that he had been told by John Lennon himself to see that the diaries were delivered to John’s son, Julian, in the event of John’s death. When the man tried to deliver the diaries to Julian, John’s wife Yoko had the man arrested on the charge of stealing the diaries. Yoko took possession of the diaries herself. And she kept them. That’s all I have for today. Maybe more tomorrow. we tried to understand with our science. instead of the robot spacecraft we send. The song was written by Brian Wilson and Mike Love about Shirley Johnson England, the daughter of the owner of radio station KNAK in Salt Lake City, Utah where she worked as a teenager. She borrowed her father's Ford Thunderbird to study at the library at the University of Utah. While at the library she met up with some friends, went to a hamburger stand, and ended up at the drive-in movies. When her father found out, he took the car away. The next day she was at the radio station complaining about it to the staff while The Beach Boys were visiting and they were inspired to write this song. Murry Wilson, the father of the Wilson brothers, denounced the whole idea for the song as immoral, and tried to prevent the group from recording it. The song, backed by a single-only mix of a cover version of Frankie Lymon and The Teenagers' "Why Do Fools Fall In Love", became a top-five hit. This eventually led to the musicians dismissing Murry as manager during the recording sessions for "I Get Around". as if we’re wearing it like kings or queens. that translates simply to, The Northern Crown. but you have to visit the stars themselves. to the left Saturn, to the right, Spica. Vega in the constellation Lyra. there is another bright star, Arcturus. the two bright stars Arcturus and Vega. as if we’re wearing them like kings or queens. nobody will take away their car keys. between them will stay the same. Today I was planning to do a post about the Dawn spacecraft out at the asteroids, using its ion thruster to move from the asteroid Vesta to the asteroid Ceres. I’ve posted about the Dawn spacecraft a couple of times, and I wanted to follow-up on something I said in one of those posts. And I was going to say that the Dawn spacecraft was like a plot from a science fiction movie but it was real, carrying on with the “science fiction movie” language from yesterday’s post. But my thinking, today, got completely derailed in a completely unexpected way. So I may return to the Dawn spacecraft tomorrow. I’m not sure. Today I’m just going to recount what happened to me this afternoon. Late this afternoon I was in Chicago for a while. At some point I realized I was right next door to a Chicago Public Library. So I went in to see if they had an old, obscure book about oil painting I’ve been looking for. They didn’t. And I noticed the Chicago library used a slightly different numeric classification system than our suburban libraries. Anyway, although the Chicago library didn’t have the oil painting book I was looking for, I tracked down their fine arts section and looked through the painting books they did have on the shelf. I noticed that with their classification scheme the shelves right next to the fine arts books contained pop music books. And as that registered with my thinking, I saw a photograph on the spine of one of the music books and that derailed my thinking completely. I gave up, for the moment, and for the day, really, looking at painting books and I pulled out the book with the familiar picture on the spine. I even took a photo of the cover. Pattie Boyd, of course, is the real Layla. She was the muse and inspiration behind Eric Clapton writing “Layla” and George Harrison writing “Something” and other great songs. I’ve posted about Pattie Boyd, and her autobiography, a few times. For some reason it was something like shocking, seeing that book next to the painting books. I’m so used to our suburban library system of classification that the juxtaposition was completely unexpected for me. So then I got to thinking, again, about paintings versus photographs because I think that cover photograph of Pattie Boyd from her modeling years is more beautiful than any painting. And I wondered, again: With photographs creating a kind of “standard” for what is possible in the realm of images, is it even possible for painters to live up to that standard, or even surpass it in one way or another? And I’ve done posts about the trend in fine arts called hyperrealism, where artists embrace photorealism as a craft and make selection or some other criteria a part of the process: The Margins Of Water In The Wild and The Abandonment Of Meaning and “Kari Loses An Underwire From Her Bra...”. I don’t think Manet’s style is the answer, if there is one, to this issue. As eye-catching and beautiful as many of his canvases might be, I don’t think any of them match, or could have matched, the beauty captured by that photograph of Pattie Boyd. I don’t think modern hyperrealism is the answer, because that simply makes a copy of a photograph. I don’t think any of the abstraction approaches to images that developed after the post-impressionists are the answer. Abstraction doesn’t even attempt to directly mirror reality in any recognizable way. I’m starting to think that photography may have capabilities—the “autographic” value maybe that I posted about in This Woman From The Canals Of Mars—that cannot be matched by any painting approach. There very well may be some option available to painters that I’m not immediately aware of. Painters can be amazingly skillful, passionate and creative. Just because I can’t think of something that certainly doesn’t rule out a painter, some contemporary thoughtful and skillful person like Manet, looking at the issue and developing an approach or style which can duplicate or even surpass the power of photographs. But I don’t think anybody has done it yet. And I don’t think I’m going to figure out what it is myself. Of the image-making things I know and am familiar with, the only open question in my mind is: I wonder what Cezanne would have created if Pattie Boyd had posed for him? I don’t know what I would imagine Cezanne would have come up with. He almost always seemed to work out something only he would have thought of. I don’t think a Cezanne image would have been powerful or beautiful in the same way as that photograph. But I don’t know. Maybe Cezanne would have found a way to capture Pattie Boyd’s image, her beauty, or his reaction to it, in such a way that the power and beauty of his image would have equaled or exceeded the power and beauty of that photograph. Maybe the “answer”—if there is one—is the classic French business that I quoted in my post The Tache And The Touche: A painter looking at the motif, reacting to it, and shaping every touch of paint on the canvas to match the painter’s reaction to the corresponding bit of real life in front of the painter. I don’t know. That seems to take the answer out of the realm of a process or style an artist could adopt, and it would ask the artist, always, to look within, to be able to introspect so deeply and respond to that introspection so honestly, that the power and beauty the artist saw and responded to would not be duplicated, but, sort of, brought to life, again, in a different way. The famous Cezanne phrase of a harmony parallel to nature. Such an outcome wouldn’t duplicate photography. But it would, in its way, accomplish a similar end. And, in fact, it would accomplish something outside the capabilities of photography, by building on what was happening inside the artist. I’m glad we have photography. And I’m sorry painting isn’t as dynamic a cultural happening as it was in nineteenth century France, because I think I’d really enjoy seeing a great many different artists trying to deal with this in their own way. In the modern academic world painters seem to establish a consensus and then stick with it regardless of any popular reaction (or lack of one). And modern commercial fine arts seems to be driven by arbitrary, even chaotic, market forces—whatever galleries and auction houses can manage to sell. And modern pop art is hardly even accessible to painting. I bet in some way or another painters will work out this issue of mechanical images versus hand-crafted images and come up with something better than just painting quickly or abstraction or hyperrealism. Maybe it will be something like Cezanne’s approach to realism, motif-inspired harmony parallels. I’d really love to see what they come up with. Q: How many bloggers does it take to change a light bulb? A: Who has time to change light bulbs, we’re busy saving the world here! What is the Goblin Universe?